CLEAN ENERGY PROSPECTIVE: As part of the department’s policy in energizing remote areas in the country, the DOE and EU-ASEP delegation meet for the launching of seven renewable energy projects to our kababayans in Mindanao. In above photo are (L-R) European Union (EU) Project Manager Xavier Canton-Lamousse, EU Head of Development Cooperation Enrico Strampelli; Mindanao Development Authority (MinDA) Undersecretary Janet M. Lopoz; MiNDA Chief of Staff Bai Norhata Alonto; EU Programme Manager for Energy Willy Hick; DOE Assistant Secretary Redentor E. Delola; and MiNDA Assistant Secretary Romeo Montenegro. 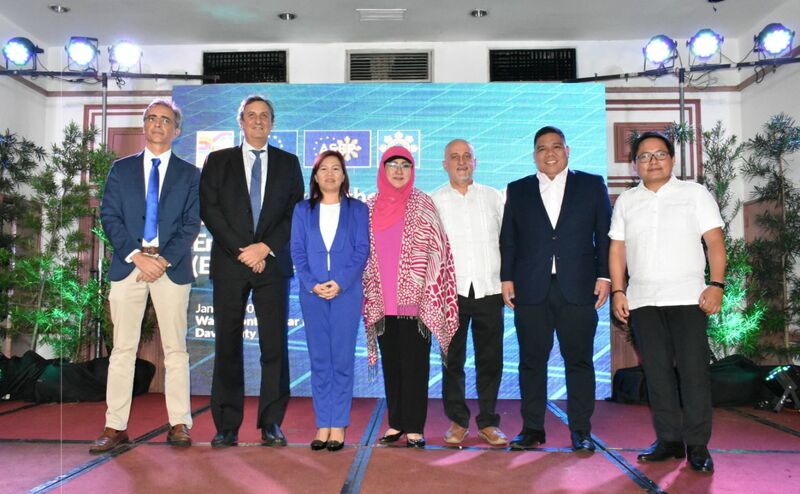 The Department of Energy (DOE) and the European Union (EU), through the Access to Sustainable Energy Programme (ASEP), launched seven renewable energy projects that would provide power to around 40,000 households in remote areas of the Philippines yesterday (30 January). According to Mr. Strampelli, the project awardees signed their respective contracts on 13 December 2018, right after the extension of the ASEP implementation period. “Over the next three years, ASEP will continue to work with the DOE in improving the lives of vulnerable communities in the country,” he added. • Strengthening Off-grid Lighting with Appropriate Renewable Energy Solutions (SOLARES): € 5 million grant to Mahintana Foundation, Inc.
Around 150 participants from the Philippine energy sector, regional and local government, civil society organizations and the academe attended said event.